Ever felt the pain of updating your office or home, but having no idea what to do with your gently used lounges, whitegoods, technology or furniture? You need to meet GIVIT. GIVIT is a national not-for-profit connecting those who have with those who need. GIVIT matches generosity with genuine need by inspiring and connecting an online network of givers. Through its website, Australian charities are supported as they request essential, quality items on behalf of their clients. GIVIT then matches these requests with items donated by members of the public, ensuring their most vulnerable residents receive exactly what they need when they need it the most. Since establishment in 2009, over 862,000 items have been donated via GIVIT to assist vulnerable, impoverished and marginalised Australians. GIVIT currently has 2,300 charities and community service organisations registered and requesting items for their clients. GIVIT makes giving easy via its free online giving portal givit.org.au, enabling everyday Australians to see exactly what items are required by vulnerable members of their local community. 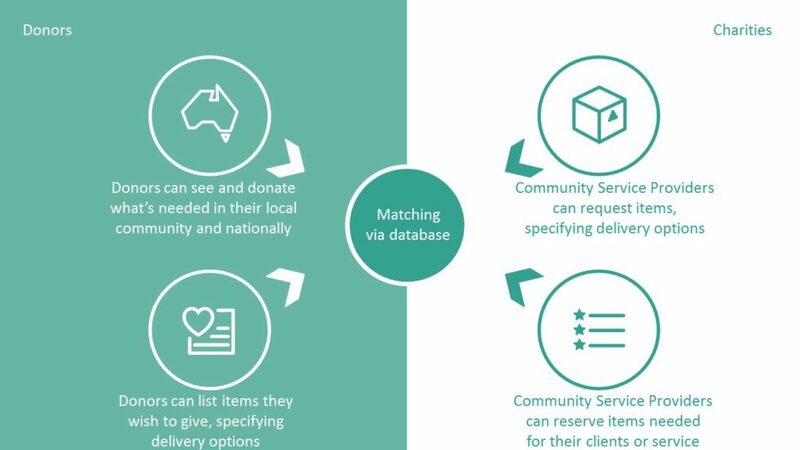 GIVIT donors are connecting with charities right across Australia and they arrange their own delivery of great quality donations they no longer need. That’s where Transdirect comes in. We like to think of Transdirect as matchmakers, just like GIVIT. GIVIT matches donors with a great new home for the items they have to give away. Our team at Transdirect matches the donor’s transport needs with a list of options for the best-suited courier. Your lightly used office furniture or computers can find a home in need in no time at all. But it’s not just lightly used items you can donate – surplus or end of line stock can also be donated by corporate donors. This is an incredible opportunity for retailers to reduce wastage and change someone’s life at the same time. Even a lawn mower can make a difference to someone who has lost everything in a fire. “Corporate donations can easily be managed with the help of Transdirect” says Caet from GIVIT. If you would like to donate as an individual, you can use Transdirect’s services too! The services we offer at Transdirect can help get your whitegoods, technology and gently used furniture to those who need it most. Learn more about our different couriers and shipping services today by downloading our Shipping Starter Guide.